What are the major classes of psychiatric medications? The table below lists the major classes of psychiatric medications, sample drugs in each class, and the primary neurotransmitter systems targeted by each medication class. Cognitive enhancers are a fairly new class of drugs, developed to treat Alzheimer’s dementia. 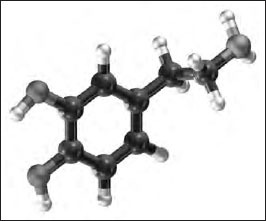 What functions does dopamine serve? The dopamine pathways serve many functions. There are, in fact, several dopaminergic tracts. The nigro-striatal tracts originate in the substantia nigra in the midbrain and project to the basal ganglia. These tracts are involved with motor control (control of physical movements) and are the neurons damaged in Parkinson’s disease. Antipsychotic drugs can also cause problems with this system, resulting in abnormal movements. The second major dopaminergic tract is known as the mesolimbic pathway. It originates in the ventral tegmental area (also in the midbrain) and projects to the nucleus accumbens and some areas of the limbic system. This tract is associated with the reward system. The third major dopaminergic tract is the mesocortical tract. Likethe mesolimbic tract, this originates in the ventral tegmental area. It projects to the cortex, with particularly rich connections in the frontal lobe. This pathway is associated with psychotic symptoms and is targeted by many antipsychotic medications.